Connection starts with conversation, and you'd love to have some conversations that lead to increased visibility, PR opportunities, and all lovely marketing goodness? Of course you do! Make sure you have a working definition which speaks to you, about what PR is. Mine is that: ” PR is part-story-telling and part-opinion-sharing. 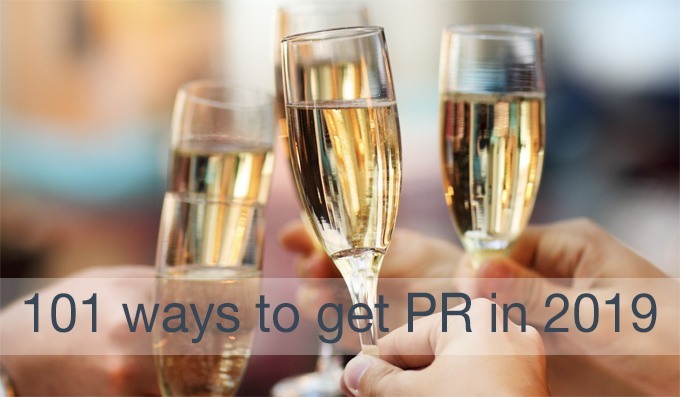 Know where PR fits into your business activities. For example, it is better if you do not do it isolation, rather you are posting on social media, developing a following, you are regularly blogging, and building a list and emailing your list. It no longer works just doing PR on its own, as the world is a lot busier now. Ensure that you know what PR looks like in 2019; such as a quote in an esteemed magazine, or a 5-minute chat on air with Jeremy Vine. Once you know what it looks like it is far easier to get iit! If you do not have a website, get one even you have one with a few pages and start blogging and sharing your views, and stories; you really want a website to be successful with PR in 2019.
if you are waiting to get a website, sign up to a Medium account: https://medium.com/ as at least you can email the media, or post your blog posts across social media to help you to get PR in 2019. Start writing blog posts on your own site or on medium, because the media loves to scan written blogs to see if you might be a fit for them. ! If you want to get on television, then make a short 3-4 minute video and post it on your about page, or even your media page, so that the media get a sense of how you will come across on camera; ideally, have this subtitled. Have a short snappy bio, 20 words, a medium bio 100 words and a long 300-word bio ready to send to the media fast; as this will help you to get PR. Start to follow the news more regularly, ideally daily; even if a quick scan of the headlines which you can do, by going to a website such as https://www.bbc.co.uk/ Ideally look at a few so you can see the nuances and biases. Understand the differences between PR and marketing, such as with marketing you have 100% control over the content ie you can alter a blog post, and with PR you have very little control. Get some good photos done even if with your smartphone to begin with, and have them ready to send to the media, as this is very important in our highly-visual age. Find out hashtags which you can use to get the media’s attention, on Twitter; such as if you are GDPR expert, ie hashtag GDPRCompliance and ensure that you use them whenever you tweet. Make sure you check for updates in your #hashtags as they often change, sometimes hourly, by typing in the hashtag into the search bar on Twitter on the right-hand side and see the latest one. Make a list of people in your industry or celebrities you would like to work with or have them quote you and start to follow them and build relationships with on Twitter. Write out a tweet and tag your newspaper to get you on their radar. Tag your local radio station, with a quote from you about a current news story on Twitter. Type into Twitter hashtag #journorequest, and respond to what comes up, that’s relevant to you. Type into Twitter hashtag #HARO and respond to what comes up that’s relevant to you. Type into Twitter hashtag #Sourcebottle and respond to what comes up that’s relevant to you. Make sure with hashtag #journorequest, #HARO, #Sourcebottle, once you type these words into the Twitter searchbar, you then put latest, as otherwise, the opportunities which come up might well have already gone!! Get a Twitter account and start live tweeting at least 5 times a day, and scheduling 5 times a day, to begin with; consistency is key. Learn how to use Twitter, by following experts in this area such as @TweetingGoddess Samantha Kelly https://www.tweetinggoddess.com/ Nicole Osbourne @Lollipop_Social https://lollipopsocial.co.uk/ or May King https://twitter.com/MayKingTea This is because PR happens more than ever on Twitter so if you do not know how to use it, or how it works you need to know or you will miss out! Remember your message is more important than your medium, building on from number 9, so your audience might be reading a newspaper you hate, but if you want them to see you, you have to go there at least once! Start supporting the media accounts on Twitter, that you want to be featured in, (your clients + ideal clients favourite media,) by retweeting them. Make sure you follow the general media accounts; such as @BBCRadioTwo, and then specific accounts such as the show you want to be on such as @TheJeremyVine, and even the Producers or research team if you can find them on Twitter. Build your relationships with your targeted media further on Twitter by commenting, on their posts and tweets. If your targeted media are looking for help, retweet them to your followers and tag people who could help them. Create Twitter lists for your top five media targets so you can maximise your time and impact on Twitter and ensure you keep your awareness high about what is happening for them, day to day or even hour to hour! Hire a professional to do your PR for you in 2019, like me! invest into a paid journalist inquiry services such as https://www.responsesource.com/pr/journalistenquiry/ Pick your category, or categories and get the pr opportunities delivered to your inbox throughout your week! Look at the trends on Twitter for what is happening in the world to keep in touch with PR opportunities which might emerge from them. Spend time watching Twitter, even if just 15 minutes a day, seeing how a story might start in a moment, which is the lightning bolt symbol and then become a trend on the left-hand column and then seeing how journalists will scramble to get help with the PR opportunities which inevitably develop by using hashtags such as #journorequests or #journorequest. Share any PR wins across your social media channels, that you have achieved, as it will help you to get more PR! Make sure you put the media icons on your website when you have been featured in the media, as it will help you to get more PR, as simple as it sounds, it is very powerful positioning! Contact the media yourself, directly, which could involve emailing them or picking up the phone. When you do this, remember to be as empathetic as possible and do not take their brusqueness personally or get put off as they are usually very stressed and on a tight deadline. When you email the media keep the email brief, to the point, not give them your life story, and make it all about how you can help them and their audience, do not lead with how great you are or that you have a new book! Tell the media you are available to talk on particular topics, do this via email, they will appreciate it! Learn how to put together a pitch email from an expert, to avoid making poor first impressions. Do not give up pitching the media by email it will happen, often when you least expect it! They can get at times up to 100 emails a day so do not take in personally if they never acknowledge your email. Plan ahead for key events such as Christmas and start sending your ideas and pitches to them in July, for example. Respond as fast as possible to #journorequests , either on Twitter or via email. I am talking within a matter of seconds if possible. Be as empathetic as possible with them, they are super stressed and a little empathy with help you to get PR in 2019! When you respond to media requests remember to lead with an attitude of ; ” how can I help you’ (ie them) not : “I’m so great, my clients love me, I have a book out no,’ as you will be guaranteed to be deleted and ignored, or even blocked! At the heart of getting PR in 2019, is realising that PR can be very messy! For example, you might write 500 words for a national and then scrap it once you have submitted it. Or you might be booked for an interview on BBC Radio 5 Live, and suddenly your interview gets scrapped because of the arrival of a certain political figure into the UK! Realise from the get-go you will make mistakes, so use Gifs on Twitter, where you can, to smooth over your relationships with the media; even though you can delete a tweet; the chances are they will have seen your tweet! Remember the media are human so do not treat them as your lunch, be respectful of their time, and what they can do for you! Be patient with the media as much as you can, as things happen in the media and all of a sudden things are scrapped, or put back or forward! Bear in mind, that once you have given them what they want, ie a few sentences for a piece about mental health issues in the workplace, you might need to gently nudge them for when it will be published, or you might just have to google it! Yes really as they are likely onto the next thing! Do not harass them about something, you want to happen, as that is a sure-fire way to put them off contacting you! When you find a piece of PR, say a newspaper article about the same subject that you want to be talking about in the press, do not hesitate to suggest a follow-up idea for the piece to the journalist, do it this fast! Be polite and thank the journalist when you get the PR, even if just via Twitter or a little thank you note, it will go a long way for when they might need you again, as they do not get thanked much sadly. Supercharge your PR learning by working with a PR coach, like me to leapfrog your learning, so you can focus on what you do best! Consume the media for your targeted media and let them know your thoughts, only here if positive! They will value you, and it will start to build your relationship with them and could land you some PR later on down the line. Find out who is a producer for a particular radio show, by calling up the radio station, or even the assistant producer and email them and let them know what topics you can talk about and what your best contact numbers are and if you can be a last minute guest or not, as they will value that! When you email the media, make sure you are contacting the right person. For example; it is rarely the editor you will need, often the specific section for a magazine, for example, such as a features assistant. Understand that a publication could have a print edition and an online edition and the two might not communicate. So think where you would like to be published and ensure you contact the right journalists for it. Get their names spelled correctly, as this can annoy them, just a little! If you can look at them as people not just resources, so chat with them online or via email albeit briefly as they are busy about non-work things, you might be surprised at their response! For example, dogs, if they love dogs, it can really help you to stand out and be seen by them! Stop thinking that what you have to share is not valuable or important or needed! Nothing could be further from the truth. The media are looking 24/7 for your opinion, your story and your message, always remember that! Do your research, before you pitch, make sure that the media that you are pitching is right for your audience; such as do they actually read, listen or watch it, if not you are wasting your time! Get clear on the timings for your pitching, or sending of story ideas. For example: for a monthly magazine you might need to be thinking 4, 5, 6,7 months ahead, yes really! Understand, that last minute media stories happen all the time, so be prepared for this too, and they will love you for it! If you a journalist is reaching out on Twitter and you can help them, even if with someone else in your network, do it, they will thank you for it, and will be more likely to listen to your pitch in the future, provided it is relevant to them, obviously! Understand that Pr is not just for Christmas, for Valentines, or Easter, it is CONSTANT! For example: when the news is going on 24/7 there is simply no end as long as there is life. So this is important to bear in mind when you are starting the process of doing your own PR or in the process of working with someone else. Really, that it is constant is rather exciting as it means that there are endless chances to weigh in on the news! Use a personal touch. For example: when you are sending a pitch email to someone, you need to get their name right, and you need to demonstrate that you have consumed their content, by literally writing a few sentences about it; acknowledging their work, yes really. Be prepared You do not like being spammed? Right? Who does? The media is no different. So, before you prepare your pitch you need to do your research. Realise that PR is a constant pitch. Absolutely. Like it or not, this is the nature of it. You either learn how to do it, get someone else to do it. Oftentimes, people can find it hard not to directly talk about themselves, which is how and why it is different to marketing. Whilst you with PR less often chat about your product like a book, you are more likely though to chat about the issues around your book; relating to what is currently happening, which is quite a different thing. PR is long-game. PR it is not a quick-fix or magic pill; rather it works in combination with other sides of your business. PR needs planning You need to know what you stand for, what your story is, and what your views about issues that matter to you, and even the news before you even pitch. Tie-in to current events. Another secret is to tie your book, or your business, into what is happening currently. For example, January is known as the Personal Development month, say your book is about weight loss, you could easily link it into what is happening in January. Think about it. Failure to follow up. Once you have sent an email to them, make sure you follow up! It’s not their job to do this, it’s yours! Be relevant; say you get on a radio show to talk about bullying, talk about that, do not talk about food addiction! Stay relevant in order to get rebooked! Add value not your ego; which can be very hard for many entrepreneurs and business owners, who are so used to being ‘passionate’ about what they do! Be light-hearted, is something that has really worked for me, as that is my nature, and it helps to have a laugh with the media; which you might be surprised about! Model people on Twitter who are successful at PR, be it people like me, or industry experts. Create a Twitter list and watch, learn and tweet! Contact your regional television with a human interest story, for their weekend news coverage as it is far easier to start there. Ring up your local BBC radio station and ask for the producer’s email for a chat show and email them asking to be added to their list of experts with. The BBC, as it can quickly spiral from local to regional to national! Consume a newspaper in the week and over the weekend to keep in touch with news cycles. Set up Google Alerts, for your keywords and topics. If you do not have a Gmail account, set one up specifically for this purpose as it will send you alerts daily or weekly, helping you see what media coverage your chosen areas and words have. Write topical blog posts. For example: if you are Sales Trainer you could write a blog post about what your thoughts are about how Brexit might effect or not effect sales teams. Supercharge your results by booking a 3.5 hour masterminding call with me, for a free 15 minute chat about this, and the investment email: carrie@theblondepreneur.com. For seasonal tie ins or regular events throughout the year plan further ahead than you might normally do, as it is far more crowded than ever! It is a very crowded market place now PR, as there are more people doing their own PR and more PR people so relationships are everything, make the time to nurture these, and it will be far easier to get PR in 2019! Schedule consistent times and days when that you dedicate to PR, and stick to it to achieve your results you are looking for as consistency is at the heart of getting PR in 2019. Is PR a business trick or a business treat?